The purpose of this class is twofold: For you, the member or guest, it gives a solid grounding in script analysis – how to break down stories, characters, and dialogue, what to look for, and how to create constructive criticism. For the Network, it expands our pool of volunteer readers for our Hollywood Outreach Program (“HOP”), Television Outreach Program (“TOP”), and High Concept Screenplay Program (“HCSP”). So it’s a win-win situation! As many of our guest speakers in the past have said, and many of our members have learned for themselves, reading and analyzing scripts is one of the best ways to improve your own writing! It’s so much easier to see both glaring problems and brilliant writing in work that is not your own – and once you see it and know what to look for, you can then apply it to your own scripts. Over 500 members have taken this class over the past years, and not only have they had fun, the majority of them have reported improvement in their own craft. Members have also gotten industry reading jobs based on what they learned in the class, while others applied the knowledge while reading for our Hollywood Outreach Program, Television Outreach Program and our High Concept Screenplay Program. 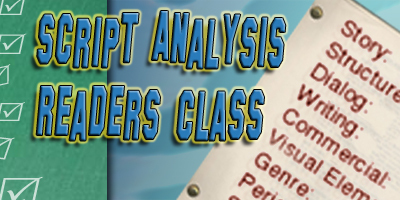 So come on out and learn the ins and outs of Script Analysis, and find ways to improve your own writing! **Readers will receive a certificate of completion after reading for a minimum of two sessions (one session per year) and/or reading ten (10) scripts in our Programs. Readers will have learned to provide positive, constructive detailed feedback/evaluations. Industry Partners and Friends, if you would like us to come out and teach this class to your group, please contact us at info@scriptwritersnetwork.org.